At Tahoe Signature Properties, we have the special privilege of providing only the most top-quality North Lake Tahoe cabin rentals in the entire northern Lake Tahoe and Truckee area. When you stay in our homey and lovely cabins in Lake Tahoe, you’ll have no shortage of ways to spend your days on Lake Tahoe. These properties are truly perfect for planning the mountainside escape of a lifetime! Whether you’re looking for a place where you can lounge around in your home away from home, or you’re simply in need of a Lake Tahoe cabin rental that is big enough to comfortably fit your vacation party, we are more than happy to assist you in finding your ideal vacation accommodations. Read on to learn more about what the best Cabin Rentals Lake Tahoe has to offer can add to your Lake Tahoe experience. Charming and quaint with immense floor plans, our cabins in Lake Tahoe are ideal for your excursion into the stunning natural beauty of Lake Tahoe. 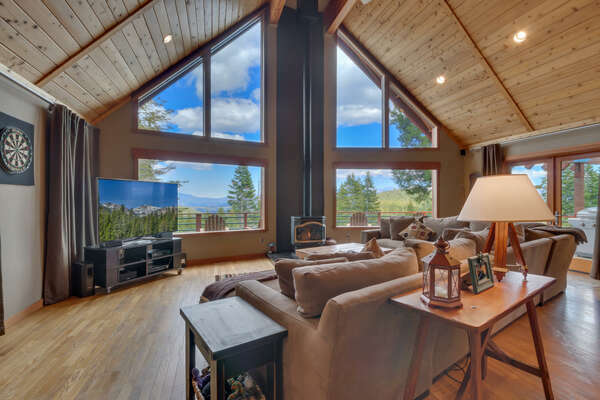 Cozy features like knotty pine accents, hardwood floors, rustic-chic décor, traditional fireplaces, and plentiful space both inside and out for taking in the spectacular views of the surrounding mountain ranges, forest greenery, and sparkling lakefront. Take advantage of luxurious features like fully-stocked gourmet kitchens, resort-style bathrooms, private hot tubs, custom home theaters, and other seemingly impossible amenities that are all available to you during your stay in our Lake Tahoe cabins. When you’re not reveling in the grand amenities in your home away from home, you can immerse yourself in exhilarating activities all around Lake Tahoe, no matter what time of year you decide to visit. Our cabins in Lake Tahoe are conveniently located central to all of the area’s most popular recreational activities. Lake Tahoe is famous for its skiing and snowboarding in the winter, as well as its boating and jet skiing during the summer season. Featuring some of the most incredible natural beauty and picturesque views in all of the United States, it’s no wonder as to why millions of people every single year make the Lake Tahoe area their preferred vacation spot. Whether you’re feeling the need to escape the hectic city life and reconnect with your roots outdoors or simply just want to get away from all the noise and people of the big city, Lake Tahoe is perfect for you! There are plenty of different ways to stay in Lake Tahoe, but we personally believe that there are no more unique or memorable ways to stay than in a Lake Tahoe cabin rental! One of the primary reasons as to why a cabin rental with Tahoe Signature Properties is so special is the fact that it will allow you to disconnect with the rest of the world and reconnect with your roots in nature. Look, life in 2018 is hectic. In between work, having to answer 100 e-mails a day, having to be glued to your phone, it’s easy to miss things happening in the world all around us! That’s why we invite you to rent one of our beautiful cabin rental homes with Tahoe Signature Properties. Once you step inside, you’ll feel as if you’ve been taken back to a much simpler time, and therefore you’re free to just take a deep breathe, relax, and take in all of the beauty that surrounds you. While Tahoe Signature Properties offers a number of different cabin rentals in Lake Tahoe, there are a few special ones in particular that we want to highlight for you. If you’re looking for a cabin with a true rustic mountain charm, then you’ve found the perfect one! With 3 bedrooms, 2 1/2 bathrooms, and enough room for up to 14 guests, this location is perfect for a family or group of friends to experience! With wide open living spaces and an absolutely gorgeous fireplace, this home really provides all the space you could need without losing the cozy mountain feel of an old school cabin. If you’re looking for something a little more upscale and luxurious for your family’s next stay, then this cabin in particular is perfect for you! This cabin features a gorgeous gourmet kitchen with top of the line appliances, granite countertops, and custom cabinetry. And if you’re looking to get out and explore all the wonderful activities Lake Tahoe has to provide, it is just minutes from the action! A vacation in Tahoe is akin to taking a step back and time. It’s the beauty of nature and the ability to slow down your pace and pay attention to the important things in life that makes this area special. Waking up early, then rolling over and going back to sleep for just another hour keeps you rested and strong and ready for a big breakfast when you finally slip out of bed. Save Mart Supermarket is one of the major big box grocery stores for stocking your refrigerator, but if you prefer to shop like a local, the Glenshire General Store offers something special—friendly and personable service that you just can’t find anywhere else. Pick up some eggs, organic vegetables, juice, and a selection of craft brews, and spend some time in the kitchen of your Tahoe Signature Properties cabin creating a gourmet breakfast for your family! On those days you want someone else to do the work, Smokey’s Kitchen serves breakfast in addition to the barbecue they are famous for, and they are located just down the road from your cabin! With your belly full, it is time to hit the streets and let the shenanigans begin. This vacation is all about laughing loud and making memories. Winters in the Lake Tahoe region are the perfect time for skiing, and Tahoe Donner Downhill is where to go when you have young kids that are just learning to ski. Offering ski lessons, children’s programs, and special events that include a Glow Stick Parade and Carnival for Mardi Gras, if you have never skied before, now is the time to start! Après Ski starts out right when you dine at The Lodge Restaurant & Pub, where a roaring fire and a house-made buttered rum quickly takes the chill from your bones and leaves you feeling cozy and warm. In the summer, the Donner Lake Marina is a one stop shop for everything water related. Ski boats, SUP equipment, hydrobikes and pedal boats can be rented by the hour or by the day. Their 4th of July Night Cruise is a popular activity, allowing you to watch the fireworks displays from the deck of a boat while enjoying dinner, dessert, and specialty drinks that will give you a warm feeling in the pit of your stomach. There’s always something to do in Tahoe, and sometimes it’s the old-fashioned activities that will leave the greatest impressions! Why subject yourself to an unfortunate stay in a cramped hotel room with minimal space and no privacy for an exorbitant cost when you can rent out your very own private oasis in the form of a spacious and immaculate vacation cabin in Lake Tahoe? Contact our friendly reservations team to learn more about what there is to do and see in Lake Tahoe when you book your stay in one of the beautiful Lake Tahoe cabin rentals offered through Tahoe Signature Properties today! This is just a glimpse of the many wonderful cabin rentals that Tahoe Signature Properties has to offer, and we invite you to give us a call and see everything that we have in store for you today! Call us at 1-530-562-4242 for rates and more information, or browse through our rental listings to find the perfect home for you vacation!